Background and aims Acid-suppressive medications, particularly proton pump inhibitors (PPIs), may decrease the risk of oesophageal adenocarcinoma (OAC) in patients with Barrett's oesophagus (BO). We performed a systematic review with meta-analysis of studies evaluating the association between acid-suppressive medications (PPIs and histamine receptor antagonists (H2RAs)) and risk of OAC or high-grade dysplasia (BO-HGD) in patients with BO. Methods We performed a systematic search of multiple electronic databases and conference proceedings up to June 2013 to identify studies reporting the association between use of acid-suppressive medications and risk of OAC and/or BO-HGD in patients with BO. Summary ORs with 95% CIs were estimated. Results We identified seven observational studies (2813 patients with BO, 317 cases of OAC or BO-HGD, 84.4% PPI users). On meta-analysis, PPI use was associated with a 71% reduction in risk of OAC and/or BO-HGD in patients with BO (adjusted OR 0.29; 95% CI 0.12 to 0.79). There was a trend towards a dose–response relationship with PPI use for >2–3 years protective against OAC or BO-HGD (three studies; PPI use >2–3 years vs <2–3 years: OR 0.45 (95% CI 0.19 to 1.06) vs 1.09 (0.47 to 2.56)). Considerable heterogeneity was observed. Two studies reported the association between H2RA use and risk of OAC and/or BO-HGD (1352 patients with BO, 156 cases of OAC, 25.4% on H2RAs), and both studies did not show a significant effect. Conclusions Based on meta-analysis of observational studies, the use of PPIs is associated with a decreased risk of OAC and/or BO-HGD in patients with BO. None of the studies showed an increased risk of OAC. PPI use should be considered in BO, and chemopreventive trials of PPIs in patients with BO are warranted. The incidence of oesophageal adenocarcinoma (OAC) is rising and it is associated with high mortality. Barrett's oesophagus (BO), which is a result of chronic inflammation of the oesophagus, confers a significant increased risk of OAC. Acid-suppressive medications, particularly proton pump inhibitors (PPIs), decrease the risk and severity of erosive esophagitis and gastroesophageal reflux disease. PPIs are associated with a 71% decrease in the risk of progression to OAC and/or high-grade dysplasia in patients with BO. This effect of PPIs is typically seen after 2–3 years of use and is independent of the presence of erosive esophagitis and use of other putative chemopreventive agents like aspirin and statins. There is insufficient literature to assess whether histamine receptor antagonists modify the risk of OAC in patients with BO. In patients with BO at high risk of progression to OAC, PPI therapy may be considered for its primary chemopreventive potential. Acid-suppressive medications such as proton pump inhibitors (PPIs) and histamine receptor antagonists (H2RAs) are the most commonly used medications in the management of gastroesophageal reflux disease (GERD). Preclinical studies and early phase biomarker-based chemoprevention trials have shown that PPIs may prevent or delay progression of dysplasia in BO.6 ,7 However, PPI-related acid suppression induced hypergastrinemia and consequent proliferation have led to concerns about oncogenic potential of long-term PPI therapy.8 Epidemiological studies of the association between acid-suppressive therapy and OAC risk have been conflicting. A large population-based nested case–control study from the UK reported an increased risk of OAC in patients on long-term acid-suppressive therapy, but not independent of underlying GERD symptoms (which prompted acid-suppressive therapy).9 In contrast, several small observational studies have reported a protective association between PPI therapy and risk of progression to OAC and/or BO-HGD in a cohort of patients with BO.10 ,11 However, these studies have been limited by the small number of events, precluding a robust estimation of the true association between acid-suppressive medications and risk of OAC. To better understand this issue, we performed a systematic review with meta-analysis of all studies that investigated the association between acid-suppressive medications, PPIs and H2RAs, and OAC and/or BO-HGD in patients with BO. This systematic review was conducted and reported according to the Preferred Reporting Items for Systematic Reviews and Meta-Analyses (PRISMA) guidelines.12 The process followed a priori established protocol. We included randomised controlled trials (RCTs) or observational studies (cohort and case–control design) that met the following inclusion criteria: evaluated and clearly defined exposure to PPIs or H2RAs (exposed and unexposed group); reported OAC and/or BO-HGD risk in patients with established BO; and reported HR, relative risk (RR) or OR, or provided data for their calculation. Inclusion was not otherwise restricted by study size, language or publication type. We excluded cross-sectional studies, studies performed in the general population without knowledge of BO status, studies with insufficient information on histological progression to OAC or BO-HGD, and studies comparing medical and surgical therapy for GERD or BO. When there were multiple publications from the same population, we only included data from the most recent comprehensive report. First, we conducted a systematic literature search of Medline, Embase, Web of Science and Scopus, from inception through 15 June 2013, with the help of an expert medical librarian, to identify all relevant articles on the association between acid-suppressive medication and risk of OAC in patients with BO. Details of the search strategy are available in the online supplementary appendix. Briefly, a combination of keywords and medical subject heading terms were used, including ‘proton pump inhibitor*’, ‘PPI’, ‘acid suppress*’, ‘omeprazole’, ‘pantoprazole’, ‘esomeprazole’, ‘lansoprazole’, ‘dexlansoprazole’, ‘histamine receptor antagonists’, ‘histamine receptor blockers’, ‘ranitidine’, ‘cimetidine’ AND ‘barrett's’ OR ‘oesophageal’ AND ‘neoplasia’, ‘oesophageal adenocarcinoma’. Subsequently, two authors independently reviewed the title and abstract of studies identified in the search to exclude studies that did not answer the research question of interest, based on prespecified inclusion and exclusion criteria. The full text of the remaining articles was again independently reviewed to determine whether it contained relevant information. Next, we manually searched the bibliographies of the selected articles and review articles on the topic for additional articles. Third, we performed a manual search of conference proceedings from major gastroenterology meetings (Digestive Diseases Week, United European Gastroenterology Week and Annual Meeting of the American College of Gastroenterology; from 2008 to 2012) for additional abstracts on the topic. After study identification, data on study and patient characteristics, exposure and outcome assessment, potential confounding variables and estimates of association were independently abstracted onto a standardised form by two authors. Details of data abstraction are reported in the online supplementary appendix. To estimate the duration–response relationship, using non-users as reference, we measured the association between patients exposed to acid-suppressive medication for a short period of time (<2–3 years) and non-use, and the association between long duration of medication use (>2–3 years) and non-use. Conflicts in data abstraction were resolved by consensus, referring back to the original article. The methodological quality of case–control and cohort studies was assessed by two authors independently (SS and SK) using the Newcastle–Ottawa scale.13 Any discrepancies were addressed by a joint re-evaluation of the original article. The primary analysis focused on assessing the risk of progression to OAC and/or BO-HGD in patients with BO, among PPI users (and H2RA users) compared with non-users. We also analysed the time to progression to any neoplasia (OAC or BO-HGD or Barrett's oesophagus with low-grade dysplasia (BO-LGD)) in patients with non-dysplastic BO (time-to-event analysis) based on PPI use, as reported in cohort studies. We performed pre-planned subgroup analysis based on study design (cohort vs case–control), study location (USA vs non-USA), method of exposure ascertainment (pharmacy prescription database vs self-report vs medical record review) and proportion of patients exposed to medication in entire BO cohort at time of enrolment (>90% vs <90%). To assess the presence of a reflux-independent association between acid-suppressive medication use and risk of progression to OAC and/or BO-HGD, we performed sensitivity analysis restricting analysis to studies which adjusted for the presence of erosive esophagitis or reflux symptoms; likewise, to assess the presence of an independent chemopreventive association, we restricted analysis to studies which adjusted for concomitant use of non-steroidal anti-inflammatory drugs (NSAIDs)/aspirin or statins. We used the random-effects model described by DerSimonian and Laird to calculate summary ORs and 95% CIs.14 Since outcomes were relatively rare, ORs were considered approximations of RRs or HRs. Maximally adjusted OR, when reported in studies, was used for analysis to account for confounding variables. To estimate what proportion of total variation across studies was due to heterogeneity rather than chance, I2 statistic was calculated. In this, values of <30%, 30–60%, 60–75% and >75% were suggestive of low, moderate, substantial and considerable heterogeneity, respectively.15 ,16 Once heterogeneity was noted, between-study sources of heterogeneity were investigated using subgroup analyses by stratifying original estimates according to study characteristics (as described above). In this analysis also, a p value for differences between subgroups of <0.10 was considered statistically significant. Given the small number of studies identified in our analysis, statistical tests for assessing publications bias were not performed.17 All p values were two tailed. For all tests (except for heterogeneity), a probability level <0.05 was considered statistically significant. All calculations and graphs were performed using Comprehensive Meta-Analysis (CMA) V.2 (Biostat, Englewood, New Jersey, USA). Flow sheet summarising study identification and selection. BO, Barrett's oesophagus; GERD, gastroesophageal reflux disease. Four cohort studies reported the risk of progression to advanced neoplasia (OAC or BO-HGD)10 ,11 ,19 ,22 (with no information on risk of progression to OAC or BO-HGD separately), and one study reported the risk of progression to any grade of neoplasia (OAC or BO-HGD or BO-LGD).21 Two case–control studies included only patients with OAC as cases.18 ,20 The primary outcome was OAC in 39 and BO-HGD in 69 patients, from 1589 patients. One of the studies by Nguyen et al20 was a nested case–control study within a cohort of patients with BO, and risk estimate was reported as incidence density ratio. Table 2 shows the baseline characteristics of the patients included in these studies. The mean age at BO diagnosis ranged from 58 to 63 years in cohort studies and the mean age at OAC diagnosis was 64 years. Approximately 82.1% of the patients with BO in these studies were men. More than 75% of the patients in the studies were Caucasians. The proportion of patients with long-segment BO (>3 cm) ranged from 29% to 59% when reported11 ,19 ,22; Kastelein and colleagues only included patients with BO segment length >2 cm.10 In three studies, there was no information on baseline length of BO segment.18 ,20 ,21 Only three studies reported on the presence of erosive esophagitis in the cohort (present in 9–88% of BO cohort)10 ,19 ,22; three studies reported on the presence of reflux symptoms (present in 29–77% of cohort).10 ,18 ,22 About 22–58% of patients with BO in the included studies were concomitantly on NSAIDs/aspirin and 19–46% were on statins. On meta-analysis of six studies that reported the endpoint of OAC and/or BO-HGD, use of PPI at time of BO diagnosis was associated with decreased risk of OAC and/or BO-HGD in patients with BO (unadjusted OR 0.26; 95% CI 0.10 to 0.71). Inclusion of one additional study, which assessed the risk of progression to any grade of dysplasia or OAC in patients with non-dysplastic BO, did not significantly change the results (unadjusted OR 0.27; 95% CI 0.12 to 0.63) (figure 2A). This protective association persisted on using the maximally adjusted risk estimates reported in individual studies, with a 71% lower risk of OAC and/or BO-HGD in PPI users (adjusted OR 0.29; 95% CI 0.12 to 0.79; figure 2B). In four studies, which reported the time to progression to OAC or BO-HGD in a cohort of patients with BO, PPI users were also significantly less likely to progress to OAC or BO-HGD (adjusted HR 0.32; 95% CI 0.15 to 0.67).10 ,11 ,19 ,22 In three studies, which reported the risk of progression to any degree of dysplasia in a cohort of patients with non-dysplastic BO, PPI use was protective (adjusted OR 0.37; 95% CI 0.15 to 0.96).11 ,19 ,21 There was insufficient information in these studies to allow estimation of PPIs’ effect on risk of progression to OAC alone and BO-HGD alone. (A) Summary of unadjusted ORs assessing the risk of oesophageal adenocarcinoma (OAC) and/or high-grade dysplasia (HGD) in patients with Barrett's oesophagus (BO) with proton-pump inhibitor (PPI) exposure in all included studies. The size of the box corresponds to the weight of the given study. (B) Summary of adjusted ORs assessing the risk of OAC and/or HGD in patients with BO with PPI exposure in all included studies. The size of the box corresponds to the weight of the given study. There was considerable heterogeneity in the overall analysis (I2=81%), although this was observed primarily due to two case–control studies with divergent results18 ,20; on meta-analysis of five cohort studies, the use of PPIs was consistently and strongly associated with a lower risk of any dysplasia in patients with BO (adjusted OR 0.33; 95% CI 0.19 to 0.58; I2=10%). The association between PPIs and risk of OAC or BO-HGD was stable across study design and study location (table 3). The heterogeneity observed in the overall analysis could be partly explained based on the method of exposure ascertainment as well as what proportion of patients in the entire BO cohort were on PPIs; statistically significant risk estimates were not noted when >90% of patients in the entire BO cohort were on PPIs. The independent protective association between PPIs and risk of OAC and/or BO-HGD persisted, even on restricting analysis to studies, which adjusted for the concomitant use of NSAIDs/aspirin/statins (n=2 studies; adjusted OR 0.44; 95% CI 0.24–0.83).10 ,11 On the others, analysis of the remaining five studies which did not adjust for concomitant use of NSAIDs/aspirin/statins revealed a similar protective association between PPIs and risk of OAC and/or BO-HGD (adjusted OR 0.23; 95% CI 0.06 to 0.89). In three studies, which accounted for the presence of erosive esophagitis or reflux symptoms, use of PPI was still protective against OAC (adjusted OR 0.15; 95% CI 0.04 to 0.55). To assess whether any one study had a dominant effect on the summary OR, each study was excluded and its effect on the main summary estimate was evaluated. No study markedly affected the summary estimate or p value for heterogeneity among the other summary estimates, and the pooled point estimate remained statistically significant (range 0.22–0.41), with the corresponding 95% CI bounds remaining below 1. The presence of a duration–response relationship was examined in five studies, of which four studies observed a greater protective effect with longer duration of PPI use.10 ,11 ,18–20 For meta-analysis, we used data from three studies that were conducive for pooling since they divided exposure time intervals as short term (<2–3 years) and long term (>2–3 years);10 ,11 ,20 one of the other studies used a 6-month cutoff18 and another assessed PPI exposure in terms of delay in starting it after BO diagnosis (eventually, all patients were placed on PPIs in this cohort).19 Based on these three studies, long-term exposure to PPIs (>2–3 years) was associated with a greater protective effect on OAC and/or BO-HGD risk (adjusted OR 0.45; 95% CI 0.19 to 1.06) whereas short-term exposure (<2–3 years) was not significantly associated with OAC and/or BO-HGD (adjusted OR 1.09; 95% CI 0.47 to 2.56). There were insufficient data to allow pooling based on type, dose or frequency of use of PPIs. One study reported that the protective association of PPIs was seen at all doses, with all types and regardless of whether they were used once a day or twice a day.10 In the same study, however, the importance of adherence to PPI for the chemopreventive effect was highlighted—compared with patients who filled <90% of their PPI prescription, patients with BO who filled >90% of their PPI prescription had a significantly greater reduction in risk of progressing to OAC and/or HGD (adjusted HR 0.24; 95% CI 0.08 to 0.71). The observed cumulative incidence rates of OAC and/or BO-HGD in patients with BO overall, non-dysplastic BO and BO-LGD are 10.2, 6.8 and 18.3 per 1000 patient years, respectively.22 ,28 ,29 Using a 67% summary risk reduction of OAC and/or BO-HGD with PPI use in patients with BO, derived from cohort studies (with low heterogeneity), we estimate the number needed to treat with PPIs to prevent one case of OAC or BO-HGD in these patients at 147, 220 and 82, respectively. Two studies reported on the association between H2RA use and the risk of OAC in patients with BO (156 cases of OAC in 1352 patients with BO; 25.4% were on H2RAs).10 ,20 None of the studies individually observed a protective association. However, in one study all but one H2RA user were also on PPIs concomitantly and hence it was not possible to adequately assess the independent association between H2RA use and risk of advanced neoplasia in patients with BO10 ;in this study, H2RA use was not significantly associated with decreased risk of progression to advanced neoplasia (adjusted HR 0.83; 95% CI 0.11 to 6.03). In the other study, only unadjusted analysis on the association between H2RA use and risk of OAC was presented (unadjusted OR 1.17; 95% CI 0.78 to 1.76).20 Given these limitations, a meta-analysis on the association between H2RAs and risk of OAC and/or BO-HGD in patients with BO was not performed. In this systematic review of all published studies in 2813 patients with non-dysplastic BO (or BO-LGD), of whom 317 progressed to OAC and/or BO-HGD, we observed that PPI use was associated with a 71% risk reduction in progression to OAC and/or BO-HGD in a duration-dependent manner—PPI use >2–3 years after BO diagnosis was associated with a lower risk of OAC and/or BO-HGD, whereas PPI use for <2–3 years was not associated with a protective effect. This association was consistent and stable in cohort studies, which are at low risk of recall bias. In addition, we observed an association between PPI and risk of OAC and/or BO-HGD in patients with BO, independent of the presence of erosive esophagitis or reflux symptoms, and independent of the concomitant use of NSAIDs/aspirin and statins, albeit in a small number of studies. However, there is limited information in only two studies on the association between H2RA use and risk of OAC and/or BO-HGD in patients with BO, and a meaningful conclusion on their potential chemopreventive effect could not be drawn. There has been a theoretical concern that prolonged acid suppressive therapy with PPIs can induce hypergastrinemia, which may induce proliferation, COX-2 upregulation, potentiating oesophageal carcinogenesis.8 ,40 However, Obszynska and colleagues demonstrated that, though gastrin enhances epithelial restitution in Barrett's mucosa, it does not promote proliferation and expansion of Barrett’s segments during long-term PPI treatment.41 ,42 Hence, there is no evidence from preclinical and clinical studies that prolonged therapy with PPIs promotes oesophageal carcinogenesis, and this was also borne out in our review. The strengths of this systematic review include the following: comprehensive and systematic literature search with well defined inclusion criteria, carefully excluding redundant studies; rigorous evaluation of study quality; subgroup and sensitivity analyses to evaluate the stability of findings and identify potential factors responsible for inconsistencies; assessment of duration–response relationship using a fairly stable 2–3-year cutoff from included studies; simultaneous evaluation of unadjusted (based on raw numbers) and adjusted risk estimates, and hence, being able to evaluate the potential influence of measured confounders on the summary estimate; and low likelihood of misclassification bias since the included studies rigorously defined BO, often being reviewed by two or at least one expert gastrointestinal pathologist. Based on a systematic review and meta-analysis of all existing studies, PPI therapy is associated with a significantly decreased risk of progression to OAC and/or BO-HGD in patients with BO. Long duration (>2–3 year) of PPI use may provide a greater benefit than short duration. The effect of PPI therapy seems to be independent of NSAID/aspirin/statin use or the presence of erosive esophagitis. There is insufficient evidence to assess whether H2RAs have an independent chemopreventive effect in patients with BO. We sincerely thank Ms Pat Erwin, Medical Librarian at the Mayo Clinic Library for helping in the literature search for this systematic review and meta-analysis.
. Recent developments in esophageal adenocarcinoma. CA Cancer J Clin 2013;63:232–48.
. American Gastroenterological Association technical review on the management of Barrett's esophagus. Gastroenterology 2011;140:e18–52.
. A methodologic analysis of chemoprevention and cancer prevention strategies for gastrointestinal cancer. Nat Clin Pract Gastroenterol Hepatol 2006;3:101–11.
. Chemoprevention and Barrett's esophagus: decisions, decisions. Am J Gastroenterol 2008;103:2443–5.
. Patient preferences for the chemoprevention of esophageal adenocarcinoma in Barrett's esophagus. Am J Gastroenterol 2008;103:2432–42.
. A combination of esomeprazole and aspirin reduces tissue concentrations of prostaglandin E(2) in patients with Barrett's esophagus. Gastroenterology 2012;143:917–26.
. Review article: Barrett's oesophagus, dysplasia and pharmacologic acid suppression. Aliment Pharmacol Ther 2001;15:269–76.
. Gastrin-induced cyclooxygenase-2 expression in Barrett's carcinogenesis. Clin Cancer Res 2004;10:4784–92.
. Gastric acid suppression and risk of oesophageal and gastric adenocarcinoma: a nested case control study in the UK. Gut 2006;55:1538–44.
. Proton pump inhibitors reduce the risk of neoplastic progression in patients with Barrett's esophagus. Clin Gastroenterol Hepatol 2013;11:382–8.
. GRADE guidelines: 7. Rating the quality of evidence—inconsistency. 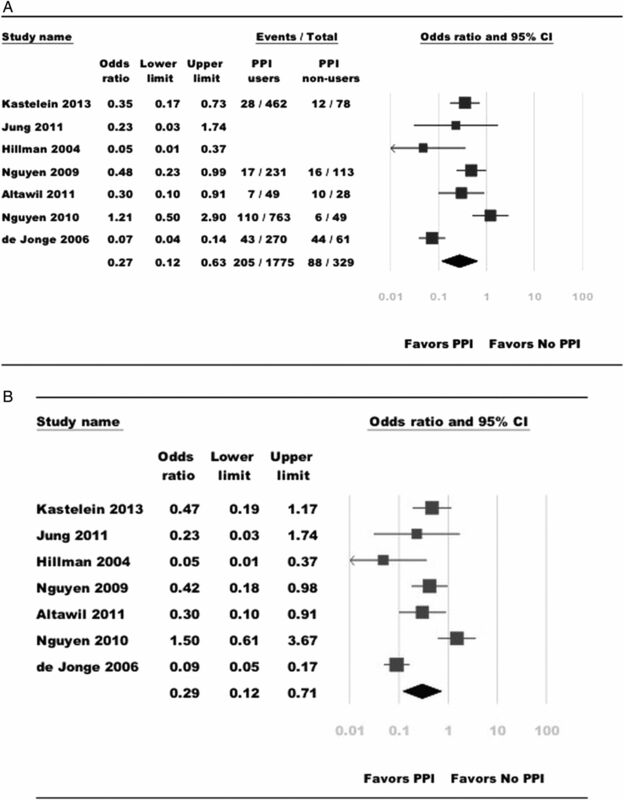 J Clin Epidemiol 2011;64:1294–302.
. ‘Systematic reviews and meta-analyses’ in Clinical Gastroenterology and Hepatology. Clin Gastroenterol Hepatol 2012;10:1184–6.
. Systematic reviews in health care: investigating and dealing with publication and other biases in meta-analysis. BMJ 2001;323:101–5.
. Risk factors for the development of esophageal adenocarcinoma in Barrett's esophagus. Am J Gastroenterol 2006;101:1421–9.
. Proton-pump inhibitor therapy and the development of dysplasia in patients with Barrett's oesophagus. Med J Aust 2004;180:387–91.
. Medications (NSAIDs, statins, proton pump inhibitors) and the risk of esophageal adenocarcinoma in patients with Barrett's esophagus. Gastroenterology 2010;138:2260–6.
. Can progression to dysplasia in Barrett's esophagus be prevented by proton pump inhibitors? Am J Gastroenterol 2011;106:S31.
. Epidemiology and natural history of intestinal metaplasia of the gastroesophageal junction and Barrett's esophagus: a population-based study. Am J Gastroenterol 2011;106:1447–55.
. Proton pump inhibitors are associated with reduced incidence of dysplasia in Barrett's esophagus. Am J Gastroenterol 2004;99:1877–83.
. Predictors for neoplastic progression in patients with Barrett's esophagus: a prospective cohort study. Am J Gastroenterol 2011;106:1231–8.
. Chemoprevention of Barrett's esophagus in patients with acid reflux. Gastroenterology 2011;140:S258.
. Treatment modality and risk of development of dysplasia and adenocarcinoma in columnar-lined esophagus. Dis Esophagus 2009;22:133–42.
. Effect of proton pump inhibitors on markers of risk for high-grade dysplasia and oesophageal cancer in Barrett's oesophagus. 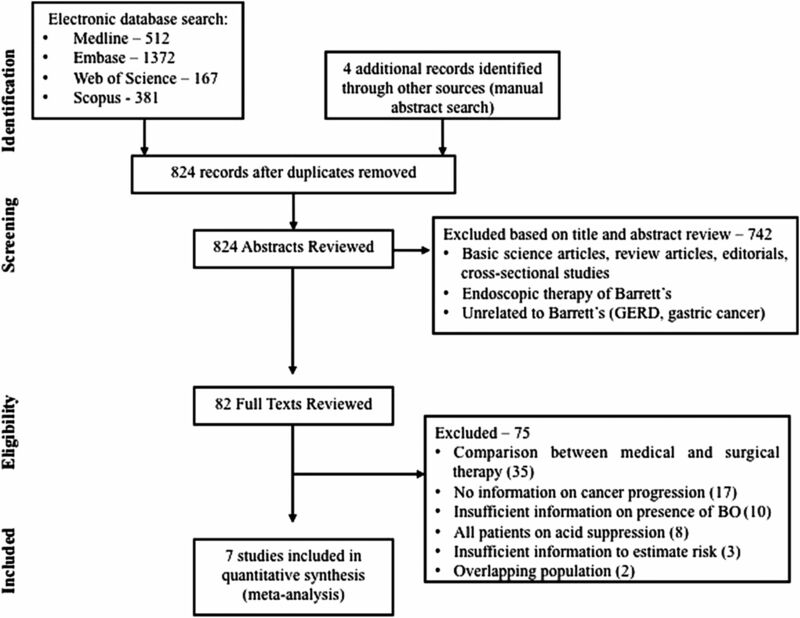 Aliment Pharmacol Ther 2008;27:321–6.
. Risk of esophageal adenocarcinoma and mortality in patients with Barrett's esophagus: a systematic review and meta-analysis. Clin Gastroenterol Hepatol 2010;8:235–44.
. Risk factors for progression of low-grade dysplasia in patients with Barrett's esophagus. Gastroenterology 2011;141:1179–86.
. Use of proton pump inhibitors and risk of progression of Barrett's esophagus to neoplastic lesions. Am J Gastroenterol 2009;104:2646–8.
. Nonsteroidal anti-inflammatory drug use reduces risk of adenocarcinomas of the esophagus and esophagogastric junction in a pooled analysis. Gastroenterology 2012;142:442–52.
. Statins are associated with reduced risk of esophageal cancer, particularly in patients with Barrett's esophagus: a systematic review and meta-analysis. Clin Gastroenterol Hepatol 2013;11:620–9.
. Barrett's oesophagus and oesophageal adenocarcinoma: how does acid interfere with cell proliferation and differentiation? Gut 2005;54(Suppl 1):i21–6.
. Cyclooxygenase 2 expression in Barrett's esophagus and adenocarcinoma: ex vivo induction by bile salts and acid exposure. Gastroenterology 2000;118:487–96.
. The role of bile acids in the neoplastic progression of Barrett's esophagus—a short representative overview. Z Gastroenterol 2012;50:1028–34.
. Differentiation and proliferation in Barrett's esophagus and the effects of acid suppression. Gastroenterology 1999;117:327–35.
. Potential anti-inflammatory effects of proton pump inhibitors: a review and discussion of the clinical implications. Dig Dis Sci 2009;54:2312–17.
. Continuous treatment of Barrett's oesophagus patients with proton pump inhibitors up to 13 years: observations on regression and cancer incidence. Aliment Pharmacol Ther 2006;23:727–33.
. Effect of proton pump inhibitors (PPIs) treatment on the length of Barrett's esophagus: a systematic review of cohort studies. Gastroenterology 2011;140:S219.
. Gastrin induces proliferation in Barrett's metaplasia through activation of the CCK2 receptor. Gastroenterology 2003;124:615–25.
. Barrett's oesophagus, proton pump inhibitors and gastrin: the fog is clearing. Gut 2010;59:148–9.
. Long-term proton pump induced hypergastrinaemia does induce lineage-specific restitution but not clonal expansion in benign Barrett's oesophagus in vivo. Gut 2010;59:156–63.
. Cost-effectiveness of chemoprevention with and without proton pump inhibitors in Barrett's esophagus. Gastroenterology 2011;140:S204–5.
. Long-term safety concerns with proton pump inhibitors. Am J Med 2009;122:896–903. Contributors Study concept and design: SS, HES; acquisition of data: SS, SK, PPS; analysis and interpretation of data: SS, SK, PPS, PGI, HES; drafting of the manuscript: SS; critical revision of the manuscript for important intellectual content: SK, PPS, PGI, HES; approval of the final manuscript: SS, SK, PPS, PGI, HES; study supervision: HES. Data sharing statement Data are available for sharing for scientific purposes.